Google reported second quarter earnings Thursday afternoon. At $2.79 billion, the figure topped last year's $2.51 billion, but fell short sequentially from this year's first quarter reading of $2.89 billion. Revenue was $10.96 billion, up 21% from last year. Google's profit margin was down, which is something that bodes poorly for future earnings reports. Fully owned subsidiary Motorola Mobility contributed red ink to the tune of $223 million on $1.25 billion in revenue. Motorola lost $86 million on $3.1 billion in sales during Q1. The Mountain View based company now has $43.1billion in cash and assets and counts 54,604 employees (34,311 for Google and 20,293 for Motorola). 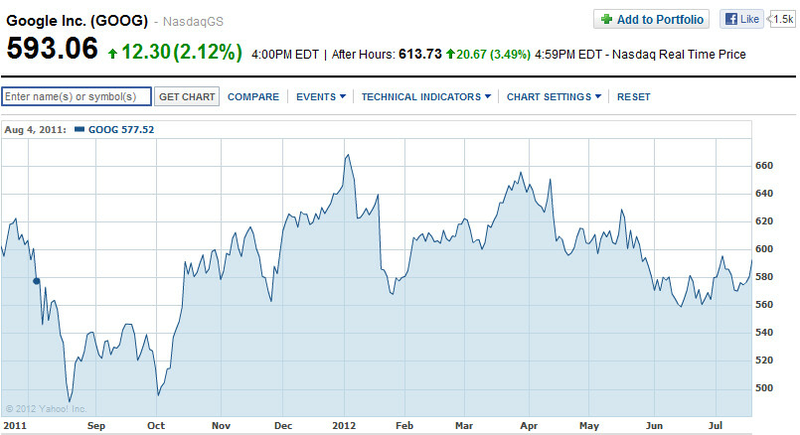 In after hours trading, Google is up $19 to $606 after closing at $593 during regular trading hours. The 52 week high is $670.25. Damn! That's a lot of money and a lot of employees! Well look at how much of a monopoly they are with searching and advertising. Google brings a lot of traffic which equals lots of money. It's far more complex than that. Google's monopoly is different than Intel's or MS. Google does not use anticompetitive practices and brings a lot of value to the masses. 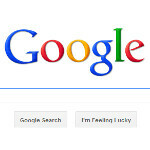 Google dominates search b-c they are better. Geez..... Come on Google, spread the love will ya??? What a great quarter. Sometimes I forget just how huge and successful of a company it is. Good for them. Imagination and risk taking has really paid off for them. Earnings and profit both fell short of analyst expectations.